The optical compass* developed by the scientists is sensitive to the sky’s polarized ultraviolet radiation. Using this “celestial compass”, AntBot measures its heading with 0.4° precision by clear or cloudy weather. The navigation precision achieved with minimalist sensors proves that bio-inspired robotics has immense capacity for innovation. Here we have a trio of advances. 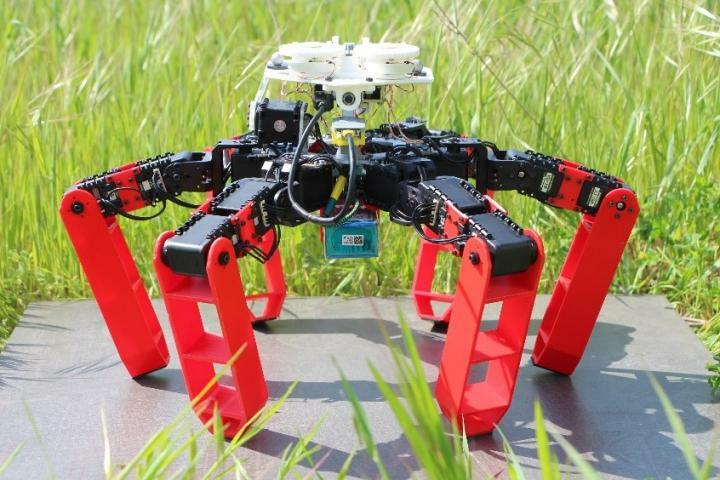 A novel robot has been developed, new, innovative and unconventional optical sensors have been designed, and AntBot brings new understanding on how desert ants navigate, by testing several models that biologists have imagined to mimic this animal. Before exploring potential applications in aerial robotics or in the automobile industry, for example, progress must be made, for instance in how to operate this robot at night or over longer distances. * – This compass is composed of only two pixels topped by two polarized filters that turn to be equivalent to an optical sensor composed of two rows of 374 pixels. Turning the filters mechanically is an innovation that has reduced the sensor’s production cost quite considerably, from over 78,000€ to only a few hundred euros, within the constraints of the biomimetics.